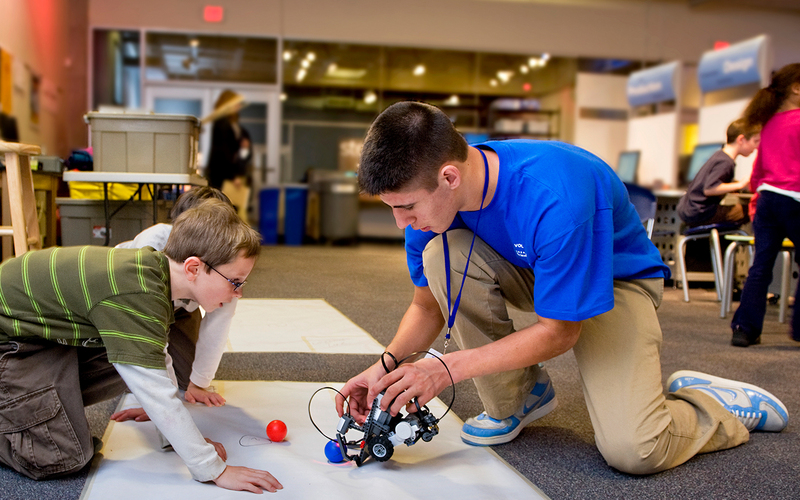 If you like having fun and meeting new people, become a volunteer at Great Lakes Science Center. You don't have to be a scientist to be part of our team! Volunteers must be at least 16 years of age and have completed eighth grade. Some opportunities require additional experience and education. All applicants are interviewed and background checked to ensure a comfortable fit for both the volunteer and the Science Center. Please note some volunteer opportunities may not be available at the time you apply. If you are interested in learning more about our program(s) or to find current volunteer positions please email volunteer@glsc.org. We are seeking dynamic individuals to help instruct Camp Curiosity's Science Day Camp programs for children in grades K-12. This is an on-the-go, out-of-the box position that not only requires a working knowledge of STEM concepts, but excitement for informal education. Volunteers help lead the instruction, organize and facilitate camp sessions in a playful and educational manner. Must be at least 16 years old. Do you have passion for science and teaching? On this team, you’ll spend the day interacting with guests and helping all ages gain an understanding and appreciation for all things STEM. Guest Engagement volunteers are found in all of the Science Center’s galleries including the NASA Glenn Visitor Center, the Science Phenomena Gallery and the Cleveland Creates Zone. Volunteers engage guests through hand-on-activities, informal demonstrations with our mobile cart activities or formal demonstrations on stage. Volunteers are asked to make a minimum commitment of one 4-hour shift per week for 3 months. Some college preferred. Great customer service is crucial for our guests' experience. Guest Service volunteers work at the information desk and provide excellent customer service by proactively solving problems and answering questions about the Science Center, its programs and events. They are knowledgeable about the Science Center and surrounding areas. Guest Service volunteers answer phones, check tickets and wristbands, give directions and act as greeters. Great Lakes Science Center asks volunteers to make a minimum commitment of one four-hour shift per week for three months. Volunteers must be at least 16 years of age. Projects include data entry, packet assembly, mailings and shredding. These projects are only available on a limited basis and are done Monday – Friday during business hours. Help with painting, electrical, plumbing and other small repairs, plus help with moving materials and furniture as needed. Volunteers must be 18 years of age and capable of lifting 50 pounds. Enter your company below to find out if your employer will match your volunteer time with a grant!